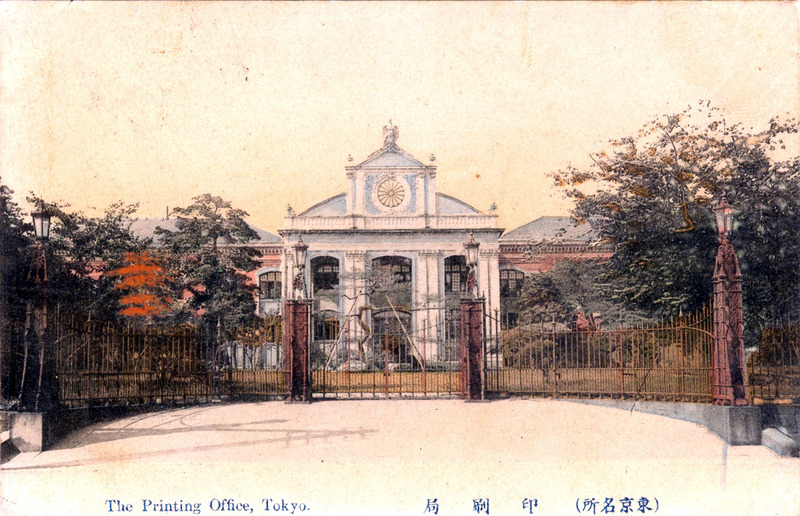 The Printing Office, Tokyo, c. 1910. “With the establishment of the Ministry of Technology (Kobu-sho) late in 1870 government building projects received a fresh impetus … During this period, 1874-1885, architecture for government offices and schools suddenly turned completely Western. Concrete and brick now replaced the earlier compromise styles of wooden frame with stone or stucco face. In this period too, the guidance in the new structures was provided by foreign architects and engineers. “The young French architect, C. De Boinville, had arrived in Japan in 1872 under a three-year government contract. He was to display to the Japanese something of the decorative style of current French architecture, as in the Printing Office, built in 1876.